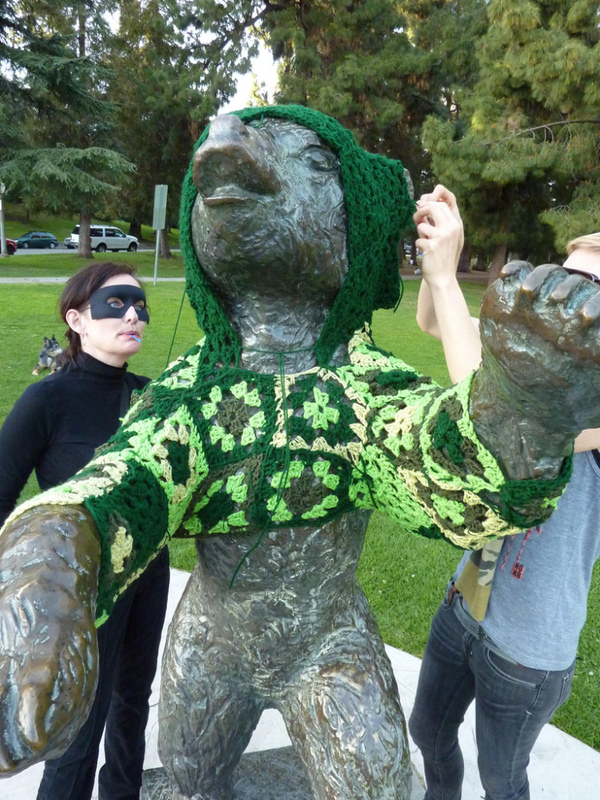 Captain Hook (left) and her accomplice, Vanessa XKiller, vandalize a bear statue in L.A.'s Griffith Park in the most cozy way possible: with a hand-crocheted hoodie. Stepping back to assess their handiwork, Vanessa concludes, it's "gangster cute." Some of the world's biggest street artists gathered in Los Angeles in April for the opening of the Art In The Streets show at the Museum of Contemporary Arts. Mingling in the crowd might have been street art legends such as Shepard Fairey or even the ever-mysterious Banksy. But not "Captain Hook." She's part of an international movement of so-called yarn bombers taking an old-school approach to street art. Unlike most street artists who travel with spray paint or markers, Captain Hook — as she asked NPR to call her — works with a crochet hook and yarn. Her "walls" are public fixtures, like the bronze bear statue in L.A.'s Griffith Park that stands zombie-like with its paws out. "This is crochet on a statue," she says, sitting in her Los Angeles apartment, a pile of granny squares in her lap. "This could be happening in 1725." In mid-March, Hook was feverishly working on the bear's 10th outfit — its St. Patrick's Day attire — a body glove in four shades of green. "I can't make the same thing over and over, so I made a vest, then some shorts, then some lederhosen," she says. "And now ... I think I'm going for the full body." It's an ambitious project, but Hook has confidence. Raised on a commune in the 1970s, Hook was part of an all-girl needlepoint workforce. "You always had to be making something," she says. "So in the houses I grew up in there were blankets, embroidered dresses and pillows ... covered in needlepoint. I mean, we rocked it. We were good." Hook, also a writer and actress, estimated it would take 20 hours to finish the outfit and anticipated having plenty of time waiting around on movie sets. But on the afternoon of the "installation," she finds herself frantically crocheting. "I've been hysterical basically," she says. "I've been up since 6 a.m." Without any time to spare, the project changes scope — Hook alters her original crocheted body glove pattern into a more manageable bear-sized hoodie. "Now, it's a shrug with a hood," she says. "It's sleeves, a back and a hood." When the time to vandalize the bear finally arrives, Captain Hook's accomplice, expert seamstress "Vanessa XKiller," meets her at the statue at 5 p.m. The duo has chosen to do the installation in broad daylight to maximize the potential for human interaction. But in the half-hour they struggle to assemble the bear's green hood, none of the people exercising, lounging in the grass or walking their dogs seem to notice. "I don't know why, but this one doesn't satisfy me like the others have," Hook says. "It seems kind of gangster cute," adds Vanessa. Despite her disappointment, Captain Hook wakes up the next morning eager to do a drive-by. But according to a text message from Vanessa, someone has already taken down the handmade shrug. Perhaps the park's maintenance crew has finally had it with Hook's work. As it turns out, though, Marshal Barrena, the park's senior gardener and the man ultimately responsible for the bear, is a fan. "It puts a little spring in your step, seeing something like that in the morning," Barrena says. In a county of 10 million people, if Captain Hook has succeeded in making one gardener and a few passersby stop and laugh, she feels she's achieved her goal. And she's already plotting her next move. "There's a bust of Valentino that I think would look really great with a scarf," she says. In Los Angeles, it seems, there's always something else out there, just begging for a pair of crocheted lederhosen. "I saw a dolphin statue in Santa Monica that stands much like the bear, fins out," she says. "When I saw that, I was like, 'Dude, your days are numbered!' "